What considerations need to be made before choosing a greenhouse addition. Conditions that need to exist in order to build a solarium/greenhouse. If you have already decided on a solarium for your greenhouse addition, we can help you take the next steps. We offer free estimates on your solarium, just fill out an estimate request. As winter approaches, gardeners all over the country feel a pang of sorrow at the first sign of an ending growing season. But you don’t have to join them. If you want to enjoy fresh grown vegetables and beautiful plants year around, consider adding a greenhouse to your living space. These glass-enclosed rooms, also called solariums, can be built onto your existing home structure like a sunroom or patio, which allows you to enter the space without fighting the harsh elements of the outside. Some homeowners open the solarium to the rest of the home during the cooler winter months, thereby permitting the heat inside the gardening space to circulate into the interior of the home. Since the interior is climate controlled, you can grow plants inside throughout the year, or you can transfer your plants outside when weather permits. This checklist includes things you need to consider prior to adding a greenhouse onto your home. Location, location, location. You probably know the area in which you want your solarium built. Most people choose the back of the house, opening up off of the main living area or kitchen area. While many people believe it’s best to build with a southern exposure, this isn’t necessarily true; however, you will want abundant sunlight. Patio Enclosures offers energy-efficient 1” thick double-pane insulated glass, which will improve heating and cooling performance, along with several glass options that block UV rays at different percentages. Gardeners can choose from a sloped or gabled straight eave, which will accommodate even the most extreme roof pitches, and our framing and sash options keep the room air tight. Outside issues. Take a look around your lot. If the space in which you plan to build is covered in trees, will you need to hire someone to remove or relocate landscaping? Once the solarium is added, is there a potential for falling limbs? If so you will need to address this issue as well. Do you have an existing outside structure on the house in the space you want your solarium? If so, what will you need to do to this structure before adding the greenhouse? Foundation and flooring. Your solarium will require a foundation on which the greenhouse can be built. Existing shrubbery must be removed and the ground needs to be level prior to construction to avoid water seeping beneath the foundation of your home. The floor must have the ability to drain well, too. During a free home consultation, a representative from Patio Enclosures can offer a thorough inspection of your property to address these points. Heating, Cooling and Shade. A successful greenhouse depends upon the right climate. Too hot and your plants will wilt; too cold and they won’t grow. Like Goldilock’s porridge, the temperature must be just right. The materials you use to build your solarium must offer protection against the elements to keep the temperature where it needs to be. Patio Enclosure’s triple polypropylene weather stripping guards against drafts, while the fin seal offers additional water protection. If you construct the solarium in a brightly lit area, you might also need to consider roll-up shades or fiberglass panels to help block the rays. We can recommend the products you need to create the perfect greenhouse addition to your home. Contact Patio Enclosures today at 1-800-230-8301, or fill out an easy contact form for an in-home, free consultation on your greenhouse addition project. 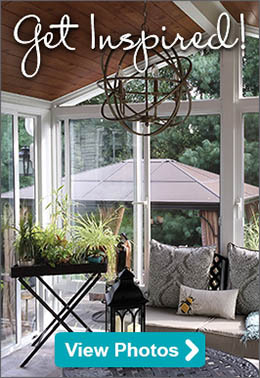 What’s the Difference Between a Sunroom and a Room Addition?